F-Zero was one of the launch titles for the Super Nintendo Entertainment System (SNES) upon its release in Japan on November 21, 1990. The game was created by Shigeru Miyamoto and developed by Nintendo Entertainment Analysis & Development (EAD), the largest division inside Nintendo. The game was set in the futuristic world of 2560, where lethargic multi-billionaires created a new form of entertainment based on Formula One races. The player was allowed to choose between four different characters that came with a different hovercars with their own respective performance strengths and weaknesses. The goal was to win the race without destroying your car from collisions with other cars, the electrified guardrail, or mines on the track. The game featured 15 tracks divided into three leagues—Knight, Queen and King—representing higher levels of difficulty. The game made extensive use of Mode 7. Mode 7 was a graphics mode found on the SNES that allowed background layers to be rotated and scaled to create different effects, such as the illusion of 3D perspective, without processing any polygons. This allowed the tracks to be scaled and rotated around the vehicle creating the illusion of movement and maintaining a high visual presentation. 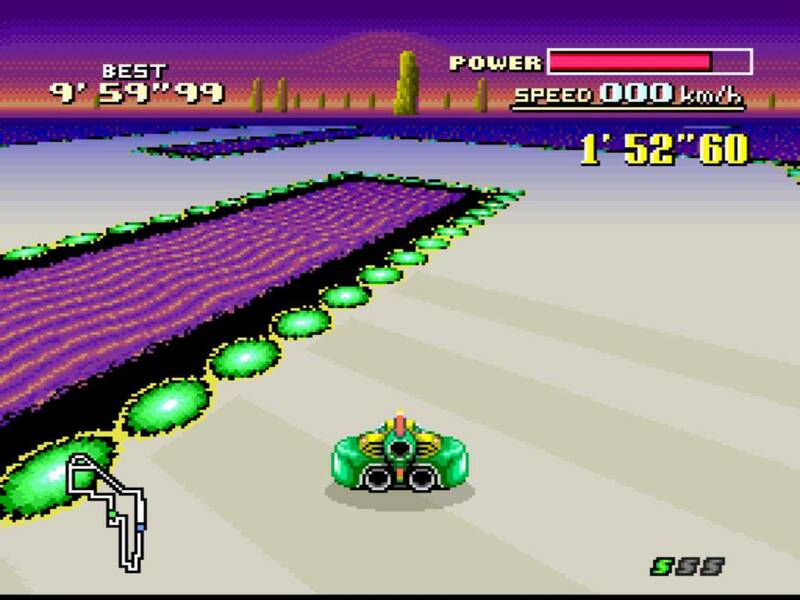 This, coupled with the speed of the gameplay, gained F-Zero recognition from critics and fans. The game is often credited as setting the standard for the racing genre and inventing the futuristic racing subgenre. 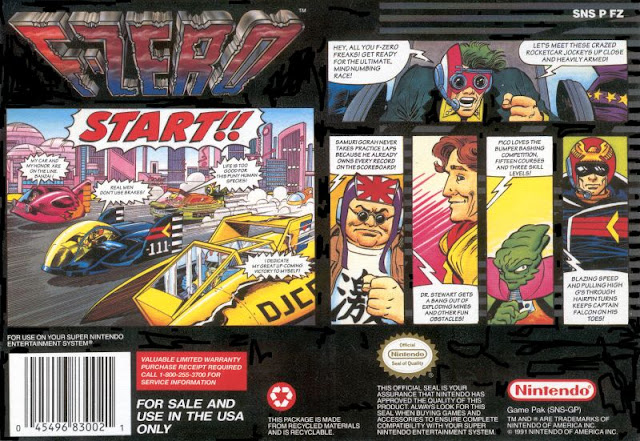 F-Zero box art depicting some of the story. The game proved a success in Japan and in other markets when it was released the following year. Nintendo quickly turned it into a franchise and greenlit sequels that added new tracks, new cars, new modes and new leagues while following a consistent narrative. The next games, BS F-Zero Grand Prix and Grand Prix 2 were unfinished games released in 1996 and 1997 as a download via the Satellaview attachment of the Super Famicom (the Japanese version of SNES). Zero Racers (G-Zero) was a cancelled game for the failed Virtual Boy system. 1998’s F-Zero X for the N64 brought he game out of pseudo-3D and into real 3D; however some of the graphics were sacrificed in order to have it run at optimal speeds. In 2000, an expansion was released exclusively in Japan for the Nintendo 64DD; a short-lived disk drive add-on to the N64. Maximum Velocity was built using Mode 7 and released in 2001 for the Game Boy Advance, featuring a return to the classic F-Zero style. It’s considered a reboot to the overall storyline of the games as it served as more of a direct sequel to the original game set 25 years later and starring the descendants of the original characters. F-Zero GX, released in 2003 for the GameCube, returned to the established storyline as a direct sequel to F-Zero X. In the first major collaboration between Nintendo and Sega, F-Zero AX was released to arcades that same year. Captain Falcon and the Blue Falcon. 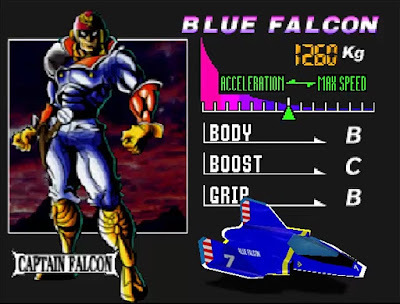 One of the series’ debut characters, Captain Falcon, was intended to be the flagship character of the SNES; however, that never panned out as he was rarely featured in Nintendo media. Instead, he became the de facto mascot of the F-Zero franchise and represented it as a fighter in the Super Smash Bros. series. 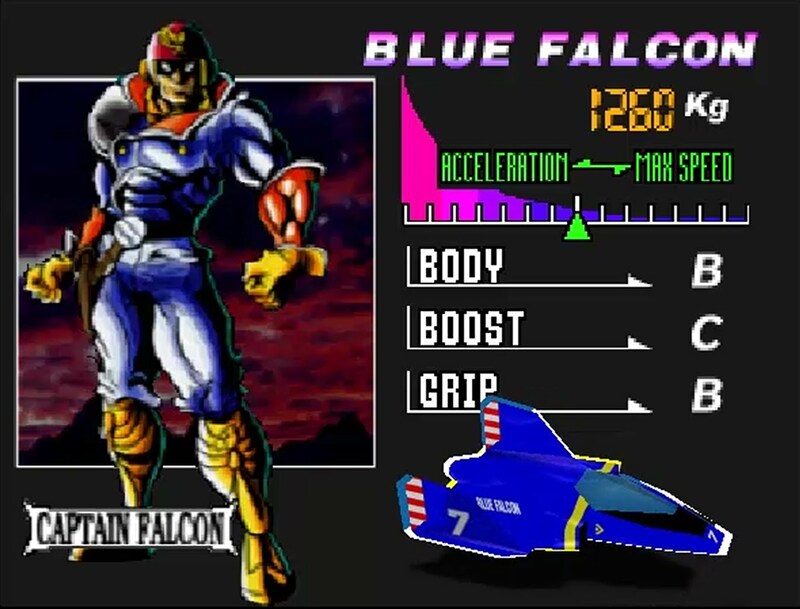 Falcon was a man of mystery, one of the best F-Zero pilots who moonlit as a renowned bounty hunter. His car was the Blue Falcon for races, and the midsized spacecraft, the Falcon Flyer, for bounty missions. F-Zero X established that Falcon’s “captain” rank may have been earned from his rumored time in the Internova Police Force. Falcon wouldn’t be featured in the games again until GX, where he was pitted against the evil Black Shadow and Deathborn, members of the sinister Dark Million Organization. It was this game that inspired the anime based on the franchise. Developed by Ashi Productions, the series was set in the year 2201 where races from all over the universe came together to compete in the F-Zero Grand Prix. Amongst them were members of The Dark Million Organization, run by the sinister Black Shadow (Norio Wakamoto & Eric Stuart). Black Shadow was a massive bull-like man with a strategic mind and seeming supernatural abilities. His plan was to use the F-Zero prizes to fund his master plan: creating the Dark Reactor which would cause the universe to implode and be reborn into a new one filled with evil. Aiding in his schemes was Zoda (Shinpachi Tsuji & Jamie McGonnigal) in the Death Anchor, a criminal from 150 years in the past revived and transformed into an alien-like being to serve Black Shadow; Miss Killer (Luna Ryder in America, voiced by Sayuri Yoshida & Karen Neill) in the Moon Shadow, Black Shadow’s right-hand woman who frequently won her races; Deathborn (Wakamoto) in the Dark Schneider, a mysterious cyborg who was the sitting chairman of the F-Zero Association; Don Genie (Chafurin) in the Fat Shark, a wealthy and powerful gangster; Octoman (Takeshi Yamato & Eric Stuart) in the Deep Claw, an octopus-like being from the planet Takora who was forced to join the organization in order to keep his creditors at bay; Bio Rex (Takayuki Fujimoto & Marc Thompson) in the Big Fang, a genetically engineered dinosaur man who began racing to prove his superiority to normal humans; Baba (Yasunobu Iwata & Sean Schemmel) in the Iron Tiger, a wild child from the planet Giant with animal instincts whose spirituality was a direct cause of his immense strength; The Skull (Fujimoto & Andrew Rennells) in the Sonic Phantom, the reanimated skeleton of a racer from 200 years in the past with an affinity for black magic; Pico (Kenichi Mochizuki & Schemmell) in the Wild Goose, an ex-military pilot that carried out particularly dangerous missions; and Blood Falcon (Banjou Ginga) in the Blood Hawk, the clone of Captain Falcon (Hideyuki Tanaka & David Willis) made from DNA stolen while Falcon was recovering from an accident. (It should be noted that some of these characters had no definitive alignment in the games in which they debuted—the anime made them villains simply because they looked villainous). The MTF: Dr. Stewart, Jody, Jack, Dr. Clash, Mr. EAD, Rick and Lucy. Opposing the Dark Million’s plans was the Mobile Task Force: a group of racers with ties to the Galactic Space Federation who raced to keep the prizes out of Dark Million’s hands. The MTF was led by the strict Jodi Sama (Jody Summer in America, voiced by Kikuko Inoue & Veronica Taylor) in the White Cat, who had to have half her body replaced with cybernetics because of an accident that claimed the life of her brother, Andy. Serving under her was Jakku Rebin (Jack Levin in America, voiced by Kazuki Yao & Thompson) in the Astro Robin, a brash ladies’ man who often gets himself into trouble who was once part of a criminal gang until Jodi arrested him; Mr. EAD (Yosunobu Iwata & Wayne Grayson) in the Great Star, an experimental android who races to complete the final testing of his IQ and AI programming (and bore a strong resemblance to Nintendo’s Mario); Dokuta Suchuato (Dr. Robert Stewart in America, voiced by Nobuo Tobita & Dan Green) in the Golden Fox, a former medical doctor who took up racing and eventually his father’s place in F-Zero following his death; Kurasshu (Dr. Clash in America, voiced by Isshin Chiba & Marc Diraison) in the Crazy Bear, an engineer who dreamed of becoming a racer and developed devices to compensate for his shortcomings; John Tanaka (Chiba & David Lapkin) in the Wonder Wasp, head cop of the MTF and an engineer with the Federation who had strong feelings for Jodi; and their newest recruit Rushi Ribati (Lucy Liberty in America, voiced by Nana Mizuki & Amy Birnbaum) in the Elegance Liberty, an enthusiastic F-Zero fan and an engineer. 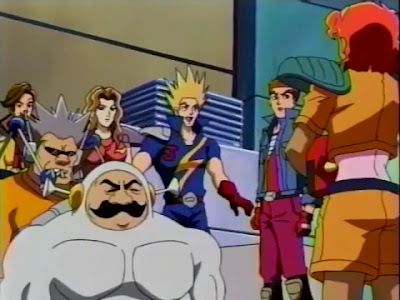 Allies to the MTF included the superhero racing legend Super Arrow (Yuichi Nagashima & Willis) and his wife, Mrs. Arrow (Yuka Komatsu & Lisa Ortiz), and space pirate Samurai Goroh (Iwata & Thompson). Ryu or Rick, he's a man lost in time. 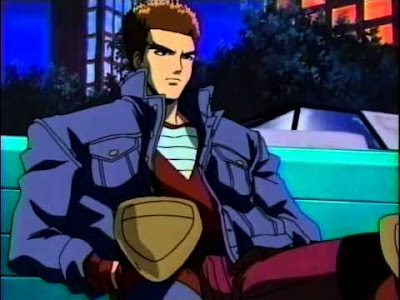 Joining the MTF was series protagonist Ryu Suzaku (whose appearance and name was inspired by Street Fighter’s Ryu, renamed Rick Wheeler in America and voiced by Toshiyuki Morikawa & John Campbell) in the Dragon Bird, a racer and police detective from New York in the year 2051. While in pursuit of Zoda, Ryu got into a fatal accident and was put into cryo-sleep. He was revived in the future because he was destined to be the savior of the universe. He was often at odds with Jakku until the two grew into friendship and sought to take out Zoda by any means necessary. It was also eventually revealed that Miss Killer was actually Ryu’s supposedly dead girlfriend Misaki Haruka (Birnbaum in the English version). She was believed to have been killed in the accident that claimed Ryu, but she was found in deep freeze and brainwashed by Black Shadow. Captain Falcon. Remember him? He's here, too. Sharing the series’ focus was popular racer and bounty hunter Captain Falcon. In this version, Falcon was shrouded in mystery and owned a bar under the alias Bart Lemming (renamed Burt in the American version). The Falcon name became a title that was earned by the best and only given to those that could beat the prior Falcon. Falcon also played a role in the central legend driving the series: that Captain Falcon and Black Shadow were the living embodiments of light and dark, the Yin and Yang, and couldn’t defeat each other on their own. It was eventually revealed that Falcon was, in fact, Jodi’s long-lost brother Andy. 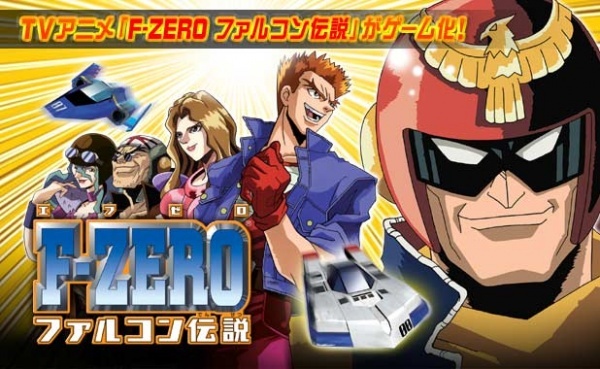 F-Zero: Farukon Densetsu (Legend of the Falcon) debuted on TV Tokyo on October 7, 2003 and ran every Thursday until September 28, 2004 for a total of 51 episodes. The series used a blend of traditional 2D animation for the characters, designed by Toyoo Ashida, and 3D CGI graphics for the cars, designed by Katsushi Murakami, and races. The original episodes were written by Akiyoshi Sakai, Ami Tomobuki, Isao Shizuya, Konosuke Takahashi, Masahiro Sonoda, Nami Ichino, Shigeru Yanagawa, Takao Koyama, Tsuyoshi Tamai, Yuichiro Takeda, Yuki Enatsu and Yukihito Nonaka. Japanese pop singer HIRO-X was signed to perform the series’ theme, “The Meaning of Truth”, while Ai Maeda performed the closing themes “Resolution” and “Forever” for the final episode. To tie into the series, a new similarly-titled game was released for the Game Boy Advance; however, they took some liberties with elements in the story making it somewhat different from the anime depiction. In 2004, Nintendo awarded 4Kids Entertainment the international broadcast rights to the anime. As with the rest of their acquired programming, 4Kids made extensive changes to the series. They sought to localize it so that American audiences could find familiarity with elements of a production and edited any scenes or content they felt were inappropriate for their target demographic (usually in the 6-11-year age range) or projected negative stereotypes. The original score (which featured reworkings of music from the games) was dropped in favor of a cheaper, generic techno score composed by Matt McGuire, Elik Alvarez, Louis Cortelezzi, Joel Douek, Josh Heineman, Freddy Sheinfeld and Russell Velazquez. Likewise, the themes were cut and replaced with an instrumental by Phil Garrod and Reed Hays. 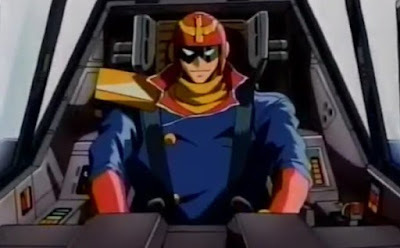 The scripts and storylines were translated and completely reworked by John Touhey, Martina Broner and Michael Haigney to reduce Captain Falcon’s role and put the narrative focus on Ryu, now called Rick Wheeler (originally, it was going to be “Pace” which was retained in some of the early commercials--like the one above), as well as to make them more kid-friendly. After learning that Miss Killer was renamed “Luna Ryder” in the 4Kids dub, Nintendo of America (who hated that name) stepped in to insist that what few untouched names remained the same. Luna Ryder suffers an identity crisis. As for the show’s name, that one wasn’t entirely a 4Kids creation. Nintendo of America was working on the localization of the game with a planned release for the fall of 2004 to coincide with the debut of the 4Kids dub. Nintendo of Europe, however, had no intentions of bringing the anime over into their market and put the game out in June of that year. To distinguish it from the anime, they changed the game’s name to GP Legend. As the 4Kids dub was already in production while Nintendo of America was still working on the game, they opted to utilize the European name in order to churn out promotional materials advertising the show. That, in turn, forced Nintendo of America to use it on their release of the game. Super Arrow and Mrs. Arrow. The newly-christened F-Zero: GP Legend debuted on FOX’s FoxBox programming block on September 4, 2004. To promote the series and the game, FOX ran a two-week contest sponsored by Nintendo called “The F-Zero Zero Zero Mega Moolah Sweepstakes.” The prizes included a Game Boy Advance SP and cash up to $5,000. While GP Legend the game proved to be a hit, albeit less so when compared to previous entries in the franchise, the 4Kids dub turned out to be a ratings flop. Only 15 episodes aired, with the final one delayed until that March following FoxBox’s rebranding as 4KidsTV. Rumors of at least two additional dubbed episodes existing have spread, but nothing else has aired beyond the initial run. Following the success of the game, a direct sequel was developed by Suzak Inc. was released in 2004 called F-Zero Climax. Available in Japan only, the game introduced a track editor which allowed players to make their own tracks to race on and share with other players. That was the most applauded feature; while the rest of the game got a lukewarm response in regards to reused elements and uneven gameplay. It was after this release that the franchise went on indefinite hiatus, with creator Miyamoto essentially stating that they’ve done all they could with the franchise until such time that Nintendo developed a unique controller interface that would enhance the gameplay experience. Until then, Nintendo continues to give the franchise exposure by incorporating it into other games; such as Captain Falcon and The Blue Falcon being in Mario Kart Wii and as downloadable content for Mario Kart 8, a mini-game called “Captain Falcon’s Twister Race” in Nintendo Land, and a Captain Falcon alternate skin for the Bryan Fury character in the Wii U version of Tekken Tag Tournament 2. “The Legend Begins” (9/4/04) – During a race, Rick Wheeler recalls the events that led him to join the MTF. “The Racer’s Edge” (9/25/04) – While the others head to a race on Planet Ninte, Rick meets Lucy Liberty before her bus to Ninte is attacked by a motorcycle gang. “Burn Out on Planet Clifoto” (10/2/04) – Lucy damages the Dragon Bird while training to join the team, potentially robbing Rick of his revenge against Zoda. “The Samurai’s Secret” (10/9/04) – Rick goes after Samruai Goroh to retrieve a medicine he stole but soon learns his target may not be who he thinks it is. “A Risky Rendezvous” (10/16/04) – Dr. Stewart and Rick try to retrieve the Astro Robin from Lisa Brilliant during the F-Zero race. “Chain Reaction” (10/23/04) – Rick becomes so focused on winning the race and beating Zoda that someone gets hurt in the process. “The Trap of Michael Chain” (10/30/04) – Rick, Lucy, Super Arrow and Mrs. Arrow help a rich man get out of being forced to kidnap top racers. “The Secret Within” (11/6/04) – The Skull sends a doppelganger of Haruka to assassinate Rick and uses a lock of Rick’s hair to curse him whenever Rick speaks her name. “The Promise” (11/13/04) – Rick races against Roger and Draq in order to win the galactic blended fruit needed to help a sick boy. “Double Jeopardy” (11/20/04) – Zoda seeks revenge against Luna Ryder for beating him and disables the shield that keeps asteroids from crashing onto the racetrack. “Blow Out” (11/27/04) – Zoda pays Antonio Guster to betray Samurai Goroh and drive a car that can destroy him in the race. “Flashback” (12/4/04) – A boy named Tek steals the Dragon Bird to give to Zoda in exchange for passage to Earth, but Captain Falcon steps in to prevent the trade-off. “Dangerous Diva” (12/11/04) – The team is tasked with protecting pop star Kate Alan from Zoda, but who’s going to protect the team from her? “Old Rivals” (12/18/04) – Jack turns to old racer Silver Neelson for training to beat Rick just as Silver’s old rival is revived from cold sleep to challenge him to a career-ending race. “Target: Tanaka” (3/5/05) – After Tanaka is targeted by Zoda, he’s put under 24-hour guard by the team.